If your countertops are covered in cracks, peeling material, dingy surfaces, or chipped areas, then it might be time to get rid of them and have fresh, smooth toppers installed. Your kitchen is the focal point of your home. Everyone congregates in the cooking zone for conversation, sneaky bites, and to spend time together. Your counters see a fair amount of use, and they are one of the first things that people see when they enter. If your countertops are covered in cracks, peeling material, dingy surfaces, or chipped areas, then it might be time to get rid of them and have fresh, smooth toppers installed. Maybe, the material or style is out-of-date, and you want something beautiful to show off; selling your home is often much easier when you replace counters and update the look of rooms like the kitchen and bath. The addition also increases the value of your home letting you recoup most, if not all, of the money you invest in the counters. 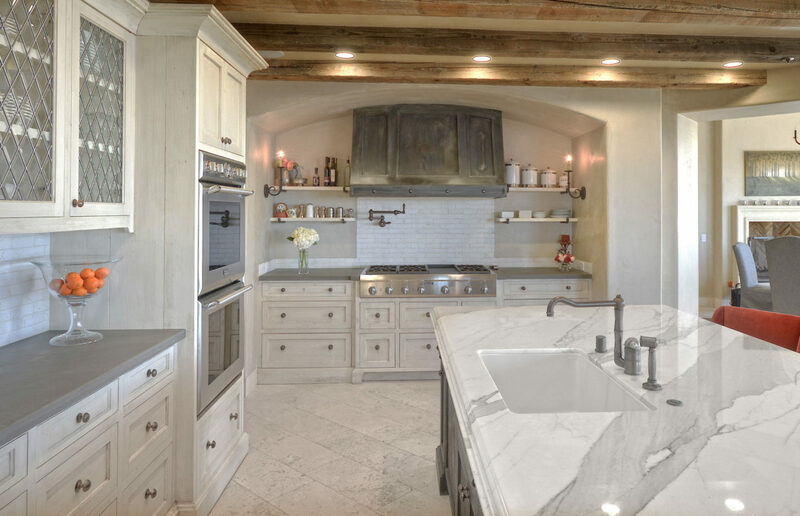 When your counters are made with stone slabs, they often hold up under tough use, but sometimes these surfaces can crack, chip, peel, break, or stain. Damage to kitchen counters can make the room unsightly, but it can also cause other problems. Granite slabs can scratch and pit when hit with a hard blow from a meat mallet or when cutting meat and vegetables. Pitting can occur causing a hazard for cooks and especially young children. Limestone is a material that can scratch and break away into little particles. Caesarstone quartz is another material that is gaining in popularity because it reflects much of the light produced by fluorescent and LED bulbs, but it requires sealing. When your stone slabs show damage, it may be best to replace them before someone gets a cut or scratch from a jagged edge. Limestone is one of those materials that is extremely susceptible to stains and discoloration. These counters can be difficult to maintain with water and other liquids causing frequent damage that is hard to remove. Marble countertops pose the same issue. Caesarstone quartz countertops and quartzite countertops can stain as well when they are not properly sealed or resealed on a regular schedule. Unsightly stains can create problems with selling a home. People who want to get the most out of their property can gain more of the home value by replacing marble countertops that look dingy and dirty. Just switching out counters can make a massive difference in home appeal when it comes to selling the house. People in San Jose and The Bay Area who want to maintain the value of their home often consider replacing countertops regularly to ensure that they are free of defects, burns, and stains. Any damage can detract from the condition of the home lowering the resale value if the owner decides to sell and move on to another property. In San Jose, The Bay Area and Silicon Valley many homeowners use Quartzite countertops and granite slabs. They improve the value of a home when new, but they can also take away from equity when they show use. Selling a home for the maximum amount is the goal of any real estate agent and property owner. The kitchen is the number one return on investment when recouping home value. Experts say that owners can often make back all or most of the money they spent updating the kitchen. If your home has outdated counters, stains, cracks, chips, or scratches, then it might be time to replace your counters with new stone slabs that increase appeal and raise the value of your home to top expectations so that you get the most out of your property. If your kitchen is much too busy, cluttered, or hard to maneuver, then it might just be time to rearrange the room and have new Caesarstone quartz or limestone counters installed. These materials need a sealer to protect them from stains and burns, but they are popular choices in new home builds. Many times, homes need rearranging to fit the growth or change in a family. If someone becomes disabled, or new additions require a remodel, then replacing your countertops allows you to rearrange the kitchen to suit your needs better. Families with several children often benefit from kitchen islands because it provides a separate prep area for cooking meals and space where little ones can sit at the island and be near mom or dad for easy watching, quick morning meals, and family conversations over a late night snack. When your kitchen is old and not so fashion-friendly, you should consider updating the room with new marble countertops. When you seal the material properly, marble is a durable material that you can use for decades. Choosing a classic color like white or black lets you set up a timeless design that will boost the value of your home letting you sell it for maximum profit when the counters are properly maintained. The matte finish of some counter materials can change the entire look of the kitchen. Choosing a material that is going to stay in style for a long time is vital if you are planning to sell your home at any point. Sometimes, it is best to save the counter replacement for just before you move out so that you can offer buyers a fresh, clean kitchen that they would be proud to own. Granite slabs with beautiful veins and striking colors grab the attention of buyers, but so do watermarks, scratches, and bubbles in your stone. When your kitchen is outdated or filled with damaged counters, then you should consider replacing them with an option that is classy, timeless, and durable to give you the most return on your investment. Should you choose to sell your home, new countertops can make or break a sale. People want their kitchen to look and feel spotless, clean and inviting. Outdated styles and damaged counters turn away potential buyers and make it hard to sell your home. You can get more money for a property that is newly renovated with a modern design. Carmel Stone Imports is one of the United States biggest importers and wholesalers of the best quality, unique and exotic natural stone. Specializing in in exotic granite, limestone, marble and Caesarstone that can transform not just your countertops but your floors, pool decks, outdoor kitchens and walls. Located in Palo Alto, CA and serving San Jose and the entire Bay Area, contact us or stop by and let us help you change your interior or exterior from ordinary to extraordinary. This entry was posted in Carmel Stone. Bookmark the permalink.